Ah, The Tale of Genji — a veritable Mount Everest for students of the Japanese language, and a fixture on so many reading lists drawn up by fans of world literature in translation as well. This formidable story of an emperor's son turned commoner, written mostly or entirely by Heian-period noblewoman Murasaki Shikibu (also known as Lady Murasaki) in the early 11th century, makes a credible claim to the status of the very first novel (or, as more timid boosters might claim for it, the first psychological novel, or the first "classic" novel). It has thus had plenty of time to get adapted into other forms: translations into modern Japanese and other currently understandable languages, annotated versions by later generations of writers, live-action movies, and animation and comic books — anime and manga. Many of those Genjis appeared in the past hundred years. 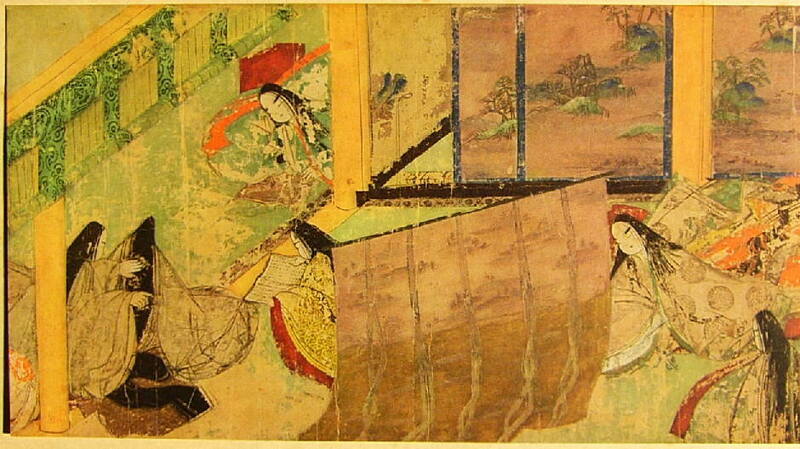 Much closer to Murasaki's own time is the Genji Monogatari Emaki, commonly called the Tale of Genji Scroll, created about a century after the Genji itself, sometime around 1120 to 1140. Here you see pieces of the scroll's surviving sections, thought to constitute only a small portion of the original work meant to depict and explain some of the events of the novel. 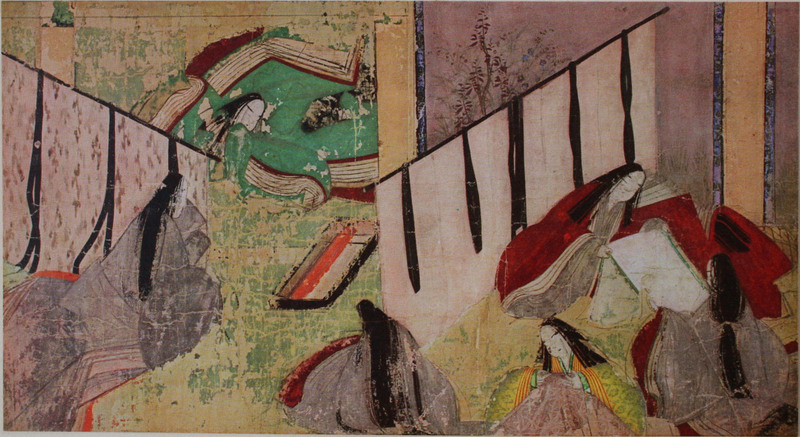 Art historians haven't pinned down the identity of the artist, but they do know that the style of these images, created with the female-dominated tsukuri-e (or "manufactured painting" process), which involves layering a drawing over pigment itself painted over a first drawing, strongly suggests a woman artist. 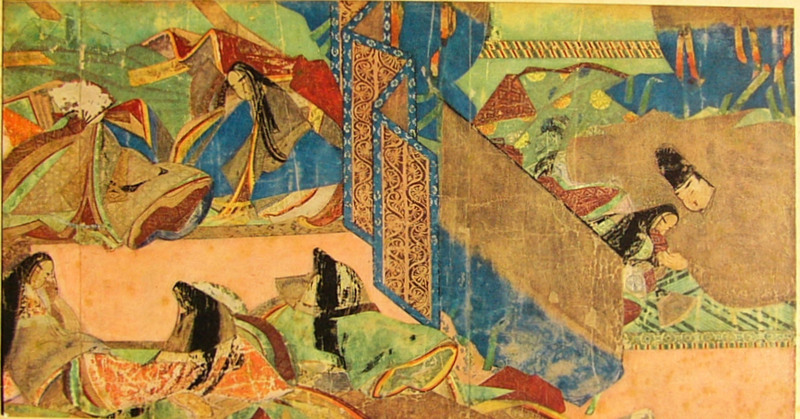 The Genji Monogatari Emaki fits into the longer Japanese tradition of picture scrolls, which first combined images and text in a groundbreaking way in the ninth or tenth century and, one could argue, continue to influence Japanese art today. That goes especially for popular Japanese art: in Japan, where you can see thousands of comic book-readers of all ages on the trains each and every day, people take the union of words and images more seriously than they do in the West — or at least Western comic art enthusiasts see it that way. So if these evocative images from the Genji Scroll make you want to pick up the novel, but you still don't know if you can handle it straight, start with one of the manga adaptations, which, as you can see, have more historical legitimacy than we might have assumed. 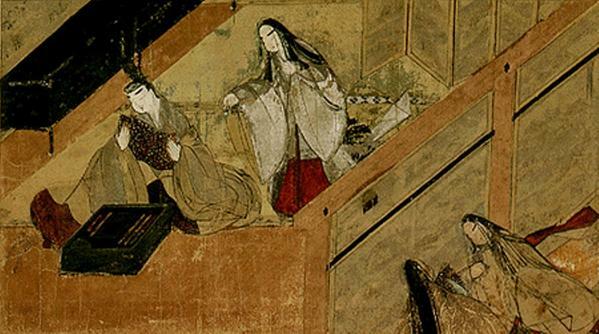 It's worth noting that Oxford has a site where you can download a complete English translation of The Tale of the Genji. A new translation by Dennis Washburn also came out in the last six months.